• Is a malignant tumor. • It accounts for 6% of all childhood cancers. • It generally grows to a large size before it is diagnosed, usually before the child reaches age 5. 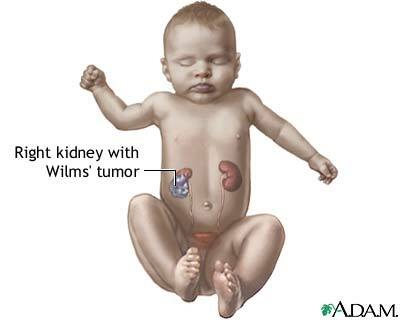 • The tumor expands the renal parenchyma, and the capsule of the kidney becomes stretched over the surface of the tumor. • Staging if from I (limited to kidney) to IV (matastasis) and stage V, which indicates bilateral involvement (rare). • The tumor may metastasize to the lymph nodes, lungs, liver, and brain. 1. A firm, non-tender mass in the upper quadrant of the abdomen is usually the presenting sign. It may be on either side. 2. Abdominal pain which is related to rapid growth of the tumor. 3. As the tumor enlarges, pressure may cause constipation, vomiting, abdominal distress, anorexia, weight loss and dyspnea. 4. Less common manifestation are hypertension, fever, hematuria, and anemia. 5. Associated anomalies includes aniridia (absence of the iris), hemihypertrophy of the vertebrae, and genitourinary anomalies. 1. Abdominal untrasound detects the tumor and assesses the status of the opposite kidney. 2. Chest X-ray and CT scan may be done to identify matastasis. 3. MRI or CT scan of the abdomen may be done to evaluate local spread to lymph nodes. 4. Urine specimens show hematuria; no increase in vanillylmandelic acid and homovanillic acid levels as occurs with neuroblastoma. 5. Complete blood count, blood chemistries, especially serum electrolytes, uric acid, renal function tests, and liver functions tests, are done for baseline measurement and to detect metastasis. 1. Chemotherapy as initiated postoperatively to achieve maximal killing of tumor cells. Drug combinations include vincristine and doxorubicin or vincristine and actinomycin D, depending on stage. 1. Surgery is the gold standard of therapy. Accurate staging by the type of the tumor and the extent of invasiveness is performed. • Observe the surgical incision for erythema, drainage or separation. Report any of theses changes. • Monitor for elevated temperature or sign of infection post-operatively. • Monitor I.V. fluid therapy and intake and output carefully, including nasogastric (NG) drainage. • Encourage the parents to ask questions and to understand fully the risk and benefits of surgery. • Prepare the child for surgery, explain the procedures at the appropriate developmental level. • Continue supporting the parents during the postoperative period. • Insert NG tube as ordered. Many children require gastric suction postoperatively to prevent distention or vomiting. • When bowel sounds have returned, begin administering small amounts of clear fluids. • Administer pain control medications as ordered in the immediate postoperative period. • Allow the child to participate in the selection of foods. • As the child recovers, encourage child to eat progressively larger meals. • If unable to eat because of radiation and chemotherapy provide I.V. fluids, hyperalimentation, or tube feedings as indicated. • Prepare child and family for fatigue during recovery from surgery and with radiation treatments. Plan frequently rest periods between daily activities. • Prepare the child and parents for loss of hair associated with chemotherapy and encourage use of hat as desired. Reassure the hair will grow back.